I don’t recall when the powers-that-be in meteorology began naming winter storms (I thought names were only for hurricanes) but a fierce blizzard given the name Nemo knocked out power on and off racetracks in the northeast this past weekend. Yonkers, the New Meadowlands, Freehold, Woodbine, Western Fair, Flamboro and Charlottetown Driving Park are tracks that cancelled programs due to being in the path of Nemo. Thus, many of our horses to watch on our exclusive list (H2W) never had a chance to participate. All of those horses will appear again in next week’s blog’s H2W listings. But we still held up well sans the canceled groups, including two huge exotics at Cal Expo (see below). Feature-wise we were left with only the Exit 16W splits at the New Meadowlands on Saturday, when Nemo was no longer a threat to northern New Jersey. We couldn’t beat the big choice Holdingallthecards in split two but we picked up the first-division winner with Yo Cheyenne Rocky, which paid $11.20. As for the Woodbine Pick 4, we suggested two horses for each leg of the TwinSpires special that offers a 10-percent bonus to winners. Two of those horses finished third and one was victorious, leg 4’s Anderlecht, that paid $8.40. The following are the horses that finished second or third from Thursday’s list along with their post-time odds. Special notes on their affects in those positions follow. Be aware that some of them were second-timers on the list and will not return next week (you may continue following them on your own, using them as you see fit). Special notes on performances appear after these lists. Viking Mia’s second place was to winner Dukeofhazards at Cal Expo, resulting in a $160.50 exacta. In that same race we listed the show horse, Hillcrest Romeo, giving the trio needed for the $1,042.10 trifeca. Peaceful Prince was second to the Pompano winner Competition Cam and that exacta came back a healthy $42.40. Hagitha was the other half of an exacta (with the favorite winning) that paid $21.40. Quiet Judy was the other half of an exacta (with the favorite winning) that paid $16.80. Ak’s Living Large, a horse that left the list this week after winning last week, won a second-straight at the Meadows, this time paying $12.20. Be aware that many winners from the H2W can and do return to score again the following week, though they never appear on the list immediately after winning. The longest horse win streak of the Dover Downs meet, 10 in-a-row and nine straight, came to an end Feb. 7 in a $25,000 Claiming pace when To Much Fun defeated Come Together. Come Together began his long win streak at Pocono Downs in 2012, where he was claimed for $10,000. He came to Dover and won for $12,500, $15,000 and was claimed again for $20,000. He then won twice for $20,000 and his previous two races for $25,000. You may recall we suggested that you find a horse to bet against Come Together for a price, since a well-paying horse would ultimately break the streak. To Much Fun paid $14.60. It would have been even higher but we like to assume our readers were involved in that win pool. Speaking of Dover, driver Corey Callahan is on fire at the Delaware oval and leads all North American drivers in wins and earnings. Callahan has 72 wins through January. Callahan also has driven winners of nearly $600,000, to lead all in 2013. Since opening day, Nov. 1, 2012, Callahan’s quest of a fourth-consecutive driver title was fully charged. Through the meet’s first 57 days, Callahan recorded 156 wins. Speaking of drivers, Brian Sears is saying he is very much at home being a Yonkers regular. Sears abandoned the New Meadowlands for more lucrative purses on the four-turn mile in New York. So far this year, Sears is winning at a 27.3-percent clip and sits atop the driver standing, according to USTA reporter Ken Weingartner. 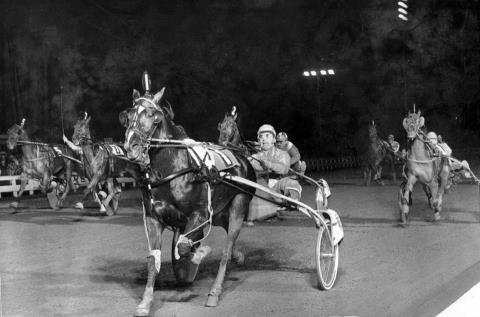 At the Meadowlands Sears was the leading driver six times. He decided to drive more regularly at Yonkers this year because as well as higher purses, Yonkers presents programs five days a week compared to the Meadowlands’ three. Sears, who has won 8,137 races lifetime, ranks sixth in earned purses in harness history with $136 million. He has won 23 Breeders Crown events, good for fourth place all time.